The holiday season is around the corner. It means you will eat more treats, have less time to do exercise and spend more time partying with family and friends. We know ’tis the season to be merry and enjoy festive meals. However, unhealthy habits can wreak a havoc on your health. 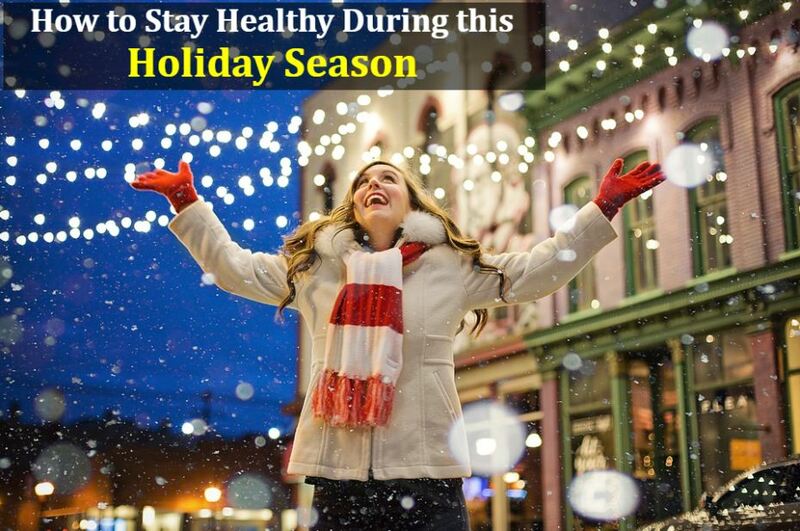 Here are some health tips that will help you to stay on track this holiday season. Eat healthy, stay hydrated: Is it possible to eat healthy meals during Christmas? Yes, absolutely. If you are organizing a party at your home, prepare dishes using only seasonal fruits and vegetables. If you are invited at someone’s home, eat only small portions and make healthy substitutes where you can. Don’t skip meals and avoid overeating. In winter months, it is challenging to drink enough water but it is essential to meet your body’s hydration needs. How much water you should drink in a day? Take your body’s weight, divide it into half – that’s the amount of fluid ounces you should take throughout the day. Exercise and get good sleep: Americans gain 1-2 pounds during the holidays. Chilly weather, shorter daylight hours and Christmas celebrations – holidays can make it tough to stay on top of your workout routine. Something is better than nothing. So exercise for at least 10-15 minutes in a day if you really have a busy schedule. If you cannot hit the gym, then walk or run as much as possible, do household chores and use fitness equipment at home to get your body moving. Holiday parties, family visits and shopping can impact your sleep timings. You have to actively take the time to relax and sleep for 7-8 hours for a better health and immunity. Spread happiness, not germs: In the US, the peak of flu season starts from late November and continues till March. Family gatherings, shopping malls, traveling, and other such outdoor activities can make you pick up the germs pretty quickly in the flu season. So protect yourself by washing your hands every time you eat and cook food. Get a flu vaccine; it reduces your risk by 70-80%. Avoid food contamination and use only clean utensils. Avoid contact with sick people. Celebrate, but responsibly: Alcohol is the leading cause of holiday accidents in the United States. Emergency room visits due to alcohol-related injuries spike during the week of Christmas and New Year’s Eve. So, drink responsibly and avoid driving. Sometimes, tiredness, stress, anxiety and decoration process also result in accidents at home. Be careful because holidays are meant to celebrate with your family at home and not at emergency treatment centers. However, accidents do happen, so save the address of an emergency room near you so that you can immediately take the patient there for emergency medical care. Do safe shoveling: Every year, 16,500 people are treated in emergency rooms for shoveling-related injuries. You must follow shoveling safety tips to prevent major injuries. Wear proper winter clothing before going out to clean driveways and staircases. Do not shovel right after eating. Feel free to take breaks in between. If you are not comfortable with snow shoveling, call experts to do it for you. In case you meet with an accident, visit an emergency room near you to get the best care you need. Holidays come once in a year. While having a fun and joyful time of the year, take care of your health too. Follow the aforementioned holiday health tips to finish the year 2018 with a bang! Stay healthy as you celebrate the holidays! Hope ER is always there for you when you need us the most. We provide emergency care services in Lufkin, TX and surrounding areas. Our Emergency Room is located on 2111 East Denman Lufkin TX 75901. Save our phone number – 9368997243. Website: www.hopeer911.com.